Funny picture time! 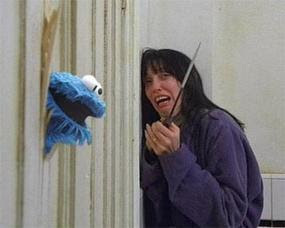 'The Shinning' lol. If you own this pic please let me know, it's hilarious! Here are some articles on freelancing and marketing tips, all from Freelanceswitch.com. They make for concise reads and may provide useful information for new freelancers who need to know more about handling the business. Remember freelancing IS a proper job if you work hard at it. Isn't it still income? Doesn't it pay the bills and for meals? It is not lazing around and having money drop on your lap. It's usually a full-day work, sometimes 9-12 hours, besides the 'flexible' hours. Personally I will hate it if people think I can run errands at any time convenient to them because I seem to be have 'flexible' time. That just interrupts my work... especially annoying when there are deadlines to meet. Mostly personal deadlines yes, but I rather keep to it than end up not accomplishing anything and wasting the day. Many people do not understand why freelancers stay at home all day instead of a 'proper' 9 - 5 job at the office, thus concluding they aren't working at all. If you have this problem, I say ignore them. You'll get used to it. They'll wonder how you ever got money to purchase that new computer or pay your rent on time, then you can explain it nicely to them lol. I love this picture! Thanks for all helpful info. Hey - thanks for the info on freelancing! really useful links, I'm going to bookmark that website! my boyfriend is a photographer and I'm always trying to convince him that selling some "stock photos" isn't selling out!